“Personalized Pathways” is the central organizing focus of our high school redesign proposal. For Academies to succeed in providing the type of high school experience Holyoke students and families want and deserve, we must make a series of related improvements. The supporting initiatives listed in exhibit 7 below emerged after our Innovations and Design Team members (see Appendix) analyzed the many systems and structures they observed at schools around the country. The initiatives below are organized according to the district’s remaining four Priorities and will enhance the success of the academy model. Two supporting initiatives aligned with the Engaged Students, Families, and Communities – “On Track” and Career and College Planning – are essential components of transforming high school in Holyoke. Our Academy model calls for student choice to design their pathway through high school and into their career and college choices. To choose well, they must have a vision on where they want to go. Each student in grades 6-12 will develop and continually build an Individual Learning Plan (ILP). 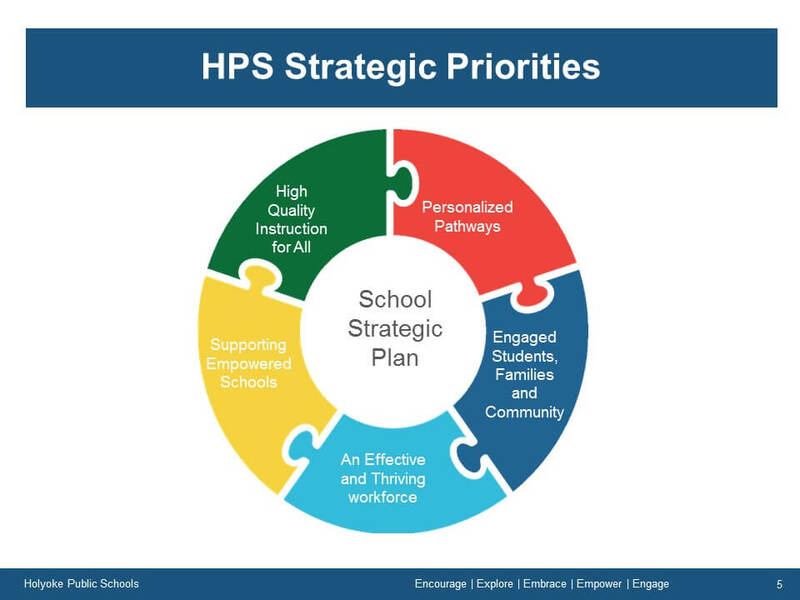 For our Holyoke students, we refer to these plans as MAPP – My Action Plan and Portfolio. Through MAPP, students will explore their own interests, personal skills, career possibilities, earning potential of various careers, college programs that open doors to various careers, and more. Each year, students will progressively build from understanding career options and their own interests to developing an increasingly sophisticated plan that could include industry sectors in which they are building a resume, specific colleges and scholarships that they aspire to attend and earn, and course planning that allow them to achieve these goals. The MAPP process will integrate workplace experiences into their portfolios, capturing what they learned and how their experiences can make them more competitive candidates to colleges and employers. It also provides opportunities for families to directly connect with their students and the teachers to collaboratively guide the student on thinking about where to aim and how to shape their high school path. Through MAPP, students set their path. With “On Track,” we make sure students stay on that path. On Track is a methodology born from research about the importance of high school grades and attendance. More than a decade of research from the University of Chicago has shown that if students pass their core academic courses, especially during their freshman year, they are highly likely to graduate high school. The research also shows that attendance – more than student academic skills – is the key driver of success, and that teacher-student trust is the key lever educators have to lift attendance and grades. Our academies will focus on helping students stay “On Track.” The academies are naturally structured for this work. The smaller cohorts of students (250-300 in an academy) with a dedicated group of academy teachers facilitate closer relationships among teachers and students. Within academies, staff will be organized into smaller Success Teams where a group of teachers and counselors “own” the success of a set of students. Each Success Team will regularly review student data on attendance and course grades and will design specific action plans for students who are off track, targeting the issue causing failure or challenge for that specific student. This work will focus on teacher-student relationships and bring teachers into closer partnership with families.